Ventricular septal defect (VSD) is a rare but serious complication of acute myocardial infarction requiring early surgical intervention. A patient with acquired VSD that spontaneously closed over three months is presented. The literature on spontaneous closure of acquired VSDs is also reviewed. Ventricular septal defects (VSDs) complicate 1%–2% of patients with acute myocardial infarction. The size of the defect determines the extent of left-to-right shunt and the haemodynamic deterioration, which in turn affects survival.1,2 Spontaneous closure of such an acquired defect has not previously been reported. A 66 year old man was admitted after a syncopal episode associated with a right sided weakness. There was no precipitating chest pain or aura. He had undergone cystoscopy and biopsy for dysuria three weeks before admission. He was a smoker of 40 packet years with no pre-existing cardiovascular symptoms or history. He denied a history of hypertension and his lipid profile was normal. Physical examination revealed a pulse of 100 beats/min, regular. The blood pressure was 100/65 mm Hg and there was a harsh systolic murmur at the left sternal edge. The chest was clear and there was no peripheral oedema. Neurological examination revealed an ataxic gait with right upper limb weakness grade 4/5. The lower limbs were normal and the plantar reflexes equivocal. The electrocardiogram showed sinus rhythm 100 beats/min, left axis deviation, ST elevation, and T wave inversion in the anteroseptal leads. The chest radiograph was normal. Serum creatine kinase fraction peak was 1085 IU/l (normal range up to 175 IU/l) with raised aspartate transaminase 68 IU/l (normal range up to 40 IU/l). Transthoracic echocardiography (fig 1) revealed ventricular septal aneurysm with a small rupture of the distal septum causing a VSD with left-to-right shunting. Towards the left ventricular apex there was laminated thrombus. Computed tomography of the brain showed a hypodense area within the left cerebellar hemisphere compatible with recent infarction. A diagnosis of a recent anteroseptal myocardial infarction complicated by a VSD, laminated left ventricular thrombus, and cerebellar embolisation was made. (A) Transthoracic echocardiogram in the apical four chamber view illustrating the left ventricle with the interventricular septum in the centre, the left ventricular lateral wall on the right of the figure, with the right ventricle on the left and the apex of the heart towards the top of the figure. The VSD is shown towards the apex with the red colour map demonstrating left-to-right blood flow across the interventricular septum. A laminated thrombus (arrow) is shown at the apex. (B) Apical two chamber view (inset) with a close-up in the main figure demonstrating the VSD in the apical anterior segment. Early closure of the VSD was not undertaken as he had severe chronic obstructive airways disease, and the defect was small and causing no haemodynamic decompensation. Therefore, it was decided to observe him closely. He was anticoagulated with warfarin and started on an angiotensin converting enzyme inhibitor (ACEI). He remained haemodynamically well and was discharged home on day 7. Three weeks later auscultation of the heart continued to reveal a soft pansystolic murmur and echocardiography showed no change in his VSD. The left ventricular thrombus had resolved. Medical therapy with warfarin and ACEI was continued. At a late follow up appointment he reported no new symptoms. However the heart murmur was no longer audible on auscultation and no VSD could be demonstrated on echocardiography (fig 2). 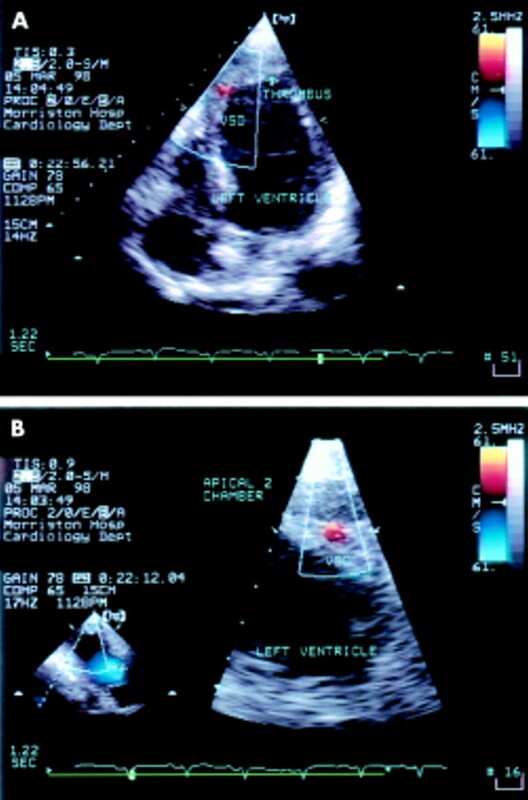 (A) Follow up transthoracic echocardiogram in the apical four chamber view illustrating the left ventricle with the interventricular septum in the centre, the left ventricular lateral wall on the right of the figure, with the right ventricle on the left and the apex of the heart towards the top of the figure. The apical thrombus has now dispersed and there is no obvious VSD on grey scale imaging. 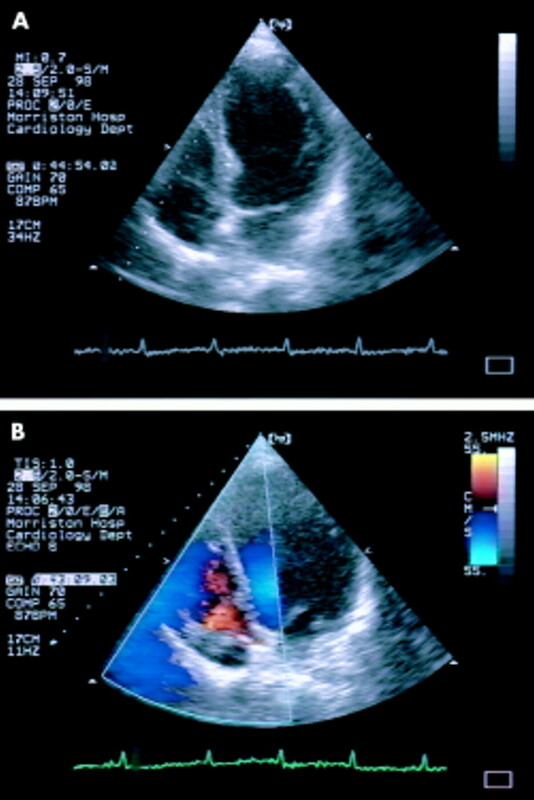 (B) Follow up transthoracic echocardiogram in the apical four chamber view with colour Doppler demonstrating the absence of any blood flow across the interventricular septum confirming resolution of the VSD. Acute myocardial infarction may occur with few or no symptoms. Left ventricular aneurysm formation leads to persisting ST segment elevation in the electrocardiogram of the affected myocardial region. Acute cerebrovascular incidents resulting from cerebral infarction should suggest the possibility of an intracardiac source. Anterior myocardial infarction with aneurysm formation should be treated with angiotensin converting enzymes to assist the remodelling process and reduce afterload thereby aiding the long term efficiency of the ventricle. Myocardial thrombus formation should be managed with immediate anticoagulation. Spontaneous closure of congenital atrial and VSDs is well recognised. Spontaneous closure of acquired VSDs after blunt trauma has been reported. Spontaneous closure of an acquired VSD after acute myocardial infarction has not been previously reported. To our knowledge, this is the first reported case of spontaneous closure of an acquired VSD arising from an anterior myocardial infarction. Ellis CJ, Parkinson GF, Jaffe WM, et al. Good long-term outcome following surgical repair of post-infarction ventricular septal defect. Aust N Z J Med1995;25:330–6. Held AC, Cole PL, Lipton B, et al. Rupture of the interventricular septum complicating acute myocardial infarction: a multicenter analysis of clinical findings and outcome. Am Heart J1988;116(5 pt 1):1330–6. Westaby S, Parry A, Ormerod O, et al. Thrombolysis and postinfarction ventricular septal rupture. J Thorac Cardiovasc Surg1992;104:1506–9. Reeder GS. Identification and treatment of complications of myocardial infarction. Mayo Clin Proc1995;70:880–4. Cummings RG, Reimer KA, Califf R, et al. Quantitative analysis of right and left ventricular infarction in the presence of postinfarction ventricular septal defect. Circulation1988;77:33–42. Vogel JH, McFadden RB, Fisher GU, et al. Spontaneous closure of residual ventricular septal defect following surgical repair of ventricular septal defect complicating acute myocardial infarction. Adv Cardiol1980;27:343–5. Krajcer Z, Cooley DA, Leachman RD. Ventricular septal defect following blunt trauma: spontaneous closure of residual defect after surgical repair. Cathet Cardiovasc Diagn1977;3:409–15. Ilia R, Goldfarb B, Wanderman KL, et al. Spontaneous closure of a traumatic ventricular septal defect after blunt trauma documented by serial echocardiography. J Am Soc Echocardiogr1992;5:203–5.